While the Great Recession did a lot of harm to the US real estate market, start ups in the sector are finally making a come back. Real estate technology companies are finally getting some major attention from venture capitalists, according to data from PitchBook. After a near dry-spell from 2009 to 2012, investors are starting to show faith that real estate tech is a worthy investment. At least two startups have already hit unicorn status with a $1 billion valuation — Opendoor, which does online real estate sales, and Compass, which is an online brokerage. Last year, $1 billion was invested in the space, and already 2017 numbers are looking good. 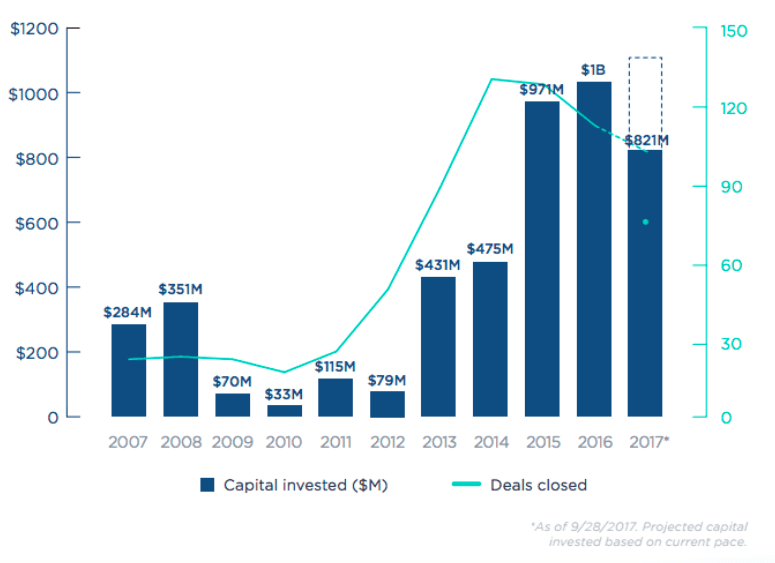 If investments continue at the current pace, the total amount of capital invested in the business in 2017 could surpass last year's $1 billion mark.